Finance professionals, especially of the MBA variety, are fascinated with the Wall Street. High finance is seen as a gateway to stratospheric riches and fast-paced career growth. It is not just the quant/finance guys who make loads of money on the Street. There are the ‘techies’ who create, operate, and manage the backend operations of computer terminals that enable high-frequency trading, which rake in the moolah. The techies also take home fat salaries and big bonuses. So, what happens when a top-class techie gets arrested by the FBI after being charged with theft by his former employer, Goldman Sachs? Vanity Fair has a very interesting piece on the life and times of Sergey Aleynikov, by Michael Lewis, author of The Big Short and Boomerang. The second question the Goldman managing director asked him was more involved—and involving. He described for Serge a room, a rectangular box, and gave him its three dimensions. “He says there is a spider on the floor and gives me its coordinates. There is also a fly on the ceiling, and he gives me its coordinates as well. Then he asked the question: Calculate the shortest distance the spider can take to reach the fly.” The spider can’t fly or swing; it can only walk on surfaces. The shortest path between two points was a straight line, and so, Serge figured, it was a matter of unfolding the box, turning a three-dimensional object into a one-dimensional surface, then using the Pythagorean theorem to calculate the distances. It took him several minutes to work it all out; when he was done, Davidovich offered him a job at Goldman Sachs. His starting salary plus bonus came to $270,000. This is a very long piece but trust me, it is an utterly fascinating and intriguing read. Please find the entire piece here. I strongly urge you to read Lewis’s The Big Short and Boomerang, especially the latter. Labels: Business, Corruption, Economics, MBA, Politics, U.S. I read the whole article. 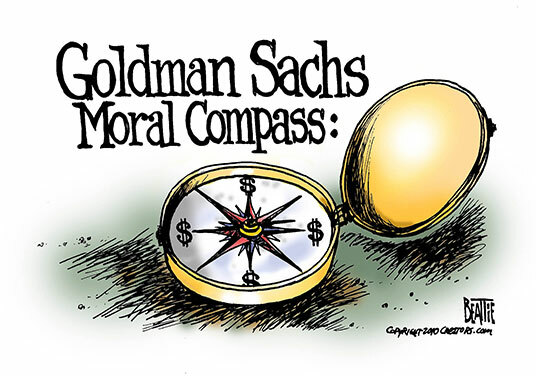 Goldman Sachs has been portrayed like an idiot bully, who desperately wants to establish his superiority by twisting some innocent kid's arms. Truly a fascinating read!